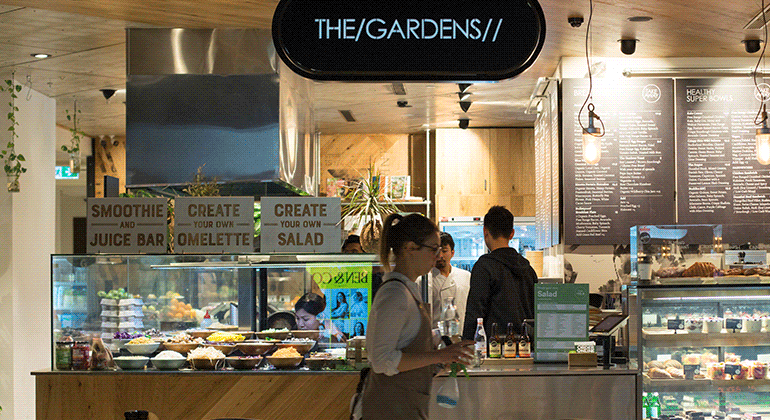 The Gardens Chifley serves a business community with wholesome food all day from early in the morning to late afternoon. It is located in a busy office precinct in the Sydney CBD. ‘We offer made-to-order freshness so we like having a pre-order app that can take the pressure off the peak periods. I make everything to order. It could be quicker if you had something premade but the thing is you’ve got no choice of what’s in it. Having people pre-order means you haven’t got people lining up at the registers during your peak hours – their order is just made up and ready to go as they arrive to pick-up. So it does ease the register – if you take an order a minute, you take 30-40 customers at the register, that’s at least half an hour you’ve saved at the register. And for the customers, it’s the convenience you’re giving them – they haven’t got time to wait in queues especially if your product takes 3, 4 5 minutes to make, and they get here and they have to wait say 3 or 4 minutes in the order/register queue plus the 4, 5 minutes to make the product …it starts adding up. And a lot of people here only have that half an hour for lunch. So it has to be time effective. Also the menu setup on the app allows customers to design-their-own salads, select their ingredients ahead of time. We’re a new business, so the orders via the YQme app is about 5% now, I’d like to push it a bit more, I want to aim for at least 20% through the app. We already have about 400 customers on our database but as this is the city and people move around a lot, you have to keep promoting it. We change the promotions – now it is 5% off all orders via the app and your first coffee free. We leave the flyers at the front near the register along with the loyalty cards. Once we build up the database more, I’ll look at promoting directly to these customers too.